Last week Microsoft announced Live Mesh. I signed up for a Tech Preview of it and have been playing with it for a couple of days now. 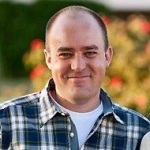 Live Mesh is a service for sharing files and applications among all of your devices. It’s designed for individuals and families trying to manage their computers and mobile devices. Currently, it only supports Windows XP and Vista, but in the future it promises to support Windows Mobile devices and Mac OS X. At first glance I felt like it was just version 2.0 of FolderShare. You have a Live Desktop on the web that you can create folders on and upload files to. You can then download the client application to your PC and set up folders on your PC to sync with your Live Desktop. In that respect it’s just like FolderShare. But you can also access these files from anywhere by logging into your Live Desktop. This piece even works great from the Mac. The only negative I see here is that there is currently a 5GB limit, since you are storing files on their server. I’m guessing when this goes live you’ll have the ability to purchase more space, but this is a big negative compared to FolderShare where the files are only stored on your machine and you can sync as much data as you want. With FolderShare you can also access the files from the web when your PC is online, but it’s actually pulling the files from your PC instead of a central service. 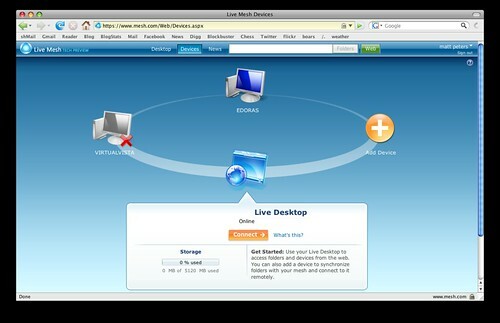 The next piece of Live Mesh is the remote desktop feature. I have it running on my PC at home. I can log into the Live Desktop from the office and then connect to my home PC. This opens a remote desktop window connect to the PC where I can run it just as if I was sitting right there. It will be interesting to see where this goes. It looks like in the future you’ll be able to remote desktop to your PC from your Windows Mobile devices as well, which will be pretty slick. I’m curious how many of these features will be supported for the Mac when support for OS X comes out. The remote desktop feature uses an Active X control, so I’m guessing I will not be able to connect remotely to the PC from the Mac, but that would be pretty sweet if they can work that out. So, I’ll be keeping my eyes on the Live Mesh Tech Preview as they release new features. I could be pretty interesting..